You have 1830 characters. Don’t forget to add important and relevant keywords in your description to improve your iTunes app page and optimize your SEO. Your app's last version was released on November 27, 2013. It is important to regularly update your app. Best practices recommend to update your app every 4 to 6 weeks. This means fixing reported bugs, improving existing features, launching new features etc. Keep an eye on users' feedback. The next great features may already be asked by many users. 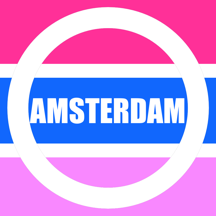 The Amsterdam Map is the best travel app for you! All the travel information and map data is loaded on your iPhone or iPad before you leave your home, so can you be on the streets, offline, and still know everything about the area you are in the city. You don’t need any network connection at all once the application is installed on your iPhone or iPad – no WiFi, no 3G, no GPRS! This is a complete travel guide for your iPhone or iPad. The entire guide is stored on your device, so it works where you have no access to the Internet - it works where Internet or GG Maps is inaccessible. This prevents expensive data roaming charges by loading all the travel and map data to your device before you leave home. You can turn off all network functions and still be able to find your way around. Lets you find all travel information, and many useful transport info such as metro, trains, trams, and many others. To make sure your phone doesn't use any expensive data on your trip, go to Settings, then General, tap on Network, and slide the Data Roaming to "off". 9. Other traffic information covering Taxis, Railway, Coaches and the integrated transportation ticket system. 10. Other useful information including emergency telephone numbers, hospital, etc.